Back in 1989, the leaders of Stockton Baptist Tabernacle (old church building before demolition shown in photo) were wrestling with the wonderful problem of growth as the Sunday morning service was so full that people were sitting on the window sills. One solution that was under consideration was the planting of a new church in Norton. At that time it was estimated that there were 9000 homes in Norton with a population of some 25-30,000 people and there were also 50 church members also living in Norton. The William Newton School (now The Education Centre) was available for hire and it was a high profile site with plenty of car parking, a good hall for meetings and classrooms for the Sunday School. For four Wednesday evenings in January, the then minister of Stockton Baptist Tabernacle, Revd. Neville Atkinson, met with church members living in Norton and Billingham to talk and pray about the possibility of planting a new church in Norton. Thirty members committed themselves to starting the new church and on Wednesday 7th March 1990, the Tabernacle church meeting formally approved the plan. There would be a morning service at 10.30am but no evening service as folk would be encouraged to still come to the Tabernacle. Just prior to Easter that year, 5000 homes were leafleted with details and Easter Sunday morning, 1990, saw the birth of the new church. The service was quite a celebration with 115 people gathered together to worship the risen Christ. For the next four years the church remained effectively a mission work of Stockton Baptist Tabernacle. Neville Atkinson preached once a month and chaired both the church meetings and the 'Steering Group' that led the church in the those first years. This group comprised Gerry Naylor as church secretary, Anthea Stout as church treasurer, Colin Laver and Geoff Kent serving as Tabernacle Elders together with others in membership at the Tabernacle. John Craggs acted as chief steward and a team of folk would set out the church each Sunday and clear everything away afterwards. The joys of rented property! Attendance hovered around 60-70 mark with the first 'fellowship' rather than 'membership' role (church membership was still with the Tabernacle) comprising 46 names in July 1991. 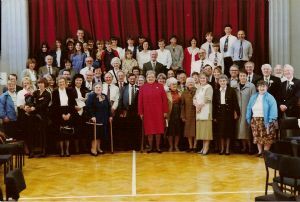 The 17th April 1994 saw the church become legally independent from the Tabernacle and Norton Baptist Church became of age with 62 members on the founding roll (see picture across). The Revd. Graham Prest became Moderator of the church, a role that subsequently changed in title to that of non-stipendary Minister in July 1996, and the first Elders and deacons were appointed to lead the church with him. In 1998, Derek Barlow took over as church secretary and Gerry Naylor switched to being church treasurer. In 2000 Graham became full-time stipendary Minister and pastored the church until 2005. 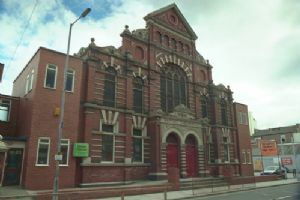 The first baptisms took place in the Tabernacle shortly after the church's first birthday in 1991 but of particular note were the baptisms of John and Judy Rutherford on 5th July 1992. They had come to faith at NBC rather than through the Tabernacle and were the firstfruits of the newly established church. Later baptisms were conducted at William Newton School using a portable baptistry as at present. During these early years the church was involved in both local and overseas mission. Three main local missions were held, the first in October 1992, and involved a team from the USA followed by two later missions. Later on, the church also supported Bruce and Kirsty Lockhart working with Scripture Union and also NBC. Graham and his family were very gifted musically so great times were had in worship. He also ran the first Alpha courses and Alpha Marriage courses in the church. A evangelistic magazine called 'Connections' was also produced that was distributed round various parts of the village and ran for about 10 years, edited initially by Edwin Pugh and lastly by Jane Hogg. You can take a trip down memory lane and download a copy of the first edition dated Spring 95 by clicking on the link. The church was also involved in supporting several missionaries, in particular David and Christine Dobinson in Spain, and Kamil and Kath Moussa in Turkey. Both couples had been sent out from the Tabernacle. In January 1997 the church commended its first 'home-grown' missionaries, Tony and Judith Sykes, who served with BMS in India for 11 years and after a few years back with us are now serving in Burundi. 1995 saw the church rent an office on Norton High Street next to Barclays Bank for use initially by the church administrator and then the Minister. This provided a measure of visibility for the church in Norton but this was discontinued after a number of years. In 1999 the church explored purchasing premises at Claymond Court for use as a worship centre but planning permission for change of use was refused the following year. In 2005, the church entered a period of ministerial interregnum and the Revd. John Bunce from the Tabernacle acted as Moderator together with assistance from the Regional Minister, Revd. John Claydon. During this time the church was led by the Elders and Deacons together with the two John's. The church got quite involved in the 'Forty Days of Community' project by Rick Warren and this had a great impact on both the leaders and the church as a whole. They also employed Enid Singleton as a part-time Pastoral Visitor to help with pastoral work, a post which she held until 31st december 2009. In February 2007 the church called Ian and Heather Fulcher to the pastorate of NBC and in September 2007, they commenced their ministry with us. In June 2009, Alan and Tammy Brand joined the staff team when Alan was appointed as Family Pastor. Alan left NBC in June 2012 to pastor Thornaby Baptist Church as 'Minister-in-Training', and is currently the Minister of 'Re:New' church in Bottisham near Cambridge. Natalie Tabler from Texas served the church as full-time Youth Worker for 15 months from May 2012 and Hannah Fulcher joined the staff team in June 2012 as our Children's Worker. Hannah concluded her ministry with us at the end of March 2015. As far as premises go, the church left The Education Centre after 23 years at Easter 2013 when Stockton Council terminated our lease due to its prospective closure. Eighteen months prior to this St. Mary's PCC had leased the Parish Hall on Norton Green to NBC with a view to us taking out a long term lease on the building. Many of our midweek ministries ran in the building as did our Sunday morning service when we left the Education Centre. However, the long-term never materialised and St. Mary's re-aquired the building at Easter 2014. The church now meets on Sundays in Rosebrook Primary School in Roseworth with the midweek ministries taking place in various locations across the area. We continue to search for building land or suitable premises to buy for the church. On the 31st December 2017 Ian retired as Minister and the church is currently in an interregnum whilst we search for a successor. Ian and Heather remain in the church and serve as church members. This also saw the end of Take 5 as our regular publication and this has now been replaced with a new newsletter. The rest, as they say, is history and this website records events that have happened since Ian and Heather came to us. Our weekly newsletter, Take 5, provides a comprehensive documentary record (see the Archive) but you will have to be keen to plough through them all! Better to browse the website! Check out the Gallery pages, in particular, the Early History page. If you want to know what happened in the first four services back at Easter 1990 then click here to find out! Gerry recorded brief details of all the Sunday services in those days in a little red book which is currently in my (Ian) possession. I have also come across a couple of old notice sheets from 9th Dec.1990 with Christmas Service details and from the 12th May 1991.